Whether you’re an experienced Facebook marketer or just getting started, retargeting is one strategy you can't afford to mismanage. Sure, retargeting seems pretty straightforward, right? Just build an audience of all the people who visited your site and advertise to them...again. Seems simple enough. Well, not exactly. To create an effective retargeting strategy, granularity plays an important role in audience creation. Taking the time to set things up properly at the outset of your remarketing campaigns will help guide them towards success as you grow and expand your audience. This remarketing guide for PPC experts will walk you through everything you need to know to set you up for maximum ROAS. Facebook retargeting is a strategy that involves targeting your company's website visitors by placing a Facebook pixel on your company's unique website visitors by placing a Facebook pixel on your site. Once Facebook knows who's been on your website, you can target these warm leads with compelling ads on their FB and Instagram feeds to drive them toward conversion. Pixels can be placed on specific pages on the website to target different parts of the conversion funnel. For example, visitors who click on the Pricing page. This strategy can also include targeting the traffic that has engaged with your brand on Facebook. Actually, 33% of consumers have a positive reaction to retargeting ads, while only 11% feel negatively about them. Retargeting ads are even 76% more likely to get clicks than regular display ads. So despite popular belief, the majority of people don’t mind seeing retargeting ads when online. In fact, as an expert marketer, you can optimize your campaigns for leads that are more likely to become customers using tools such as AdStage Join. Your goal is to target potential customers/clients/leads while they’re still hot, and hit them with relevant ads that will lead them to the desired conversion. You’ll be able to nudge this audience to your conversion goal if you serve ads that appeal to the type of engagement they previously had. And believe me, a nudge can go a long way when it comes to taking your campaigns from red to green. Why Is Facebook The Best Platform For Remarketing? Now, although people don’t necessarily mind retargeting ads, people generally don’t like seeing display ads all over the sites they visit. Most likely, visitors will not distinguish retargeting ads from the other ads on the page. Problems arise when visitors start to subconsciously tune these ads out (banner blindness) and even take steps to avoid them altogether. Ad blocker usage has grown 30% since 2016 as a response to this issue. Regardless of the reason, the fact of the matter is that people may be blocking your Google or Bing remarketing ads. Here’s where Facebook comes in. The beautiful thing about Facebook is that the platform doesn’t use banner ads to market to users; meaning adblockers won’t work! Add in the fact that there are about 4 billion active users and Facebook poses as the perfect platform for a retargeting campaign that should surely engage your audience. You might wonder why advertising to a Facebook retargeting audience is more effective than a regular interest/demographics based audience... let's discuss the types of traffic. You can think about retargeting for Facebook in terms of temperatures. Search engines like Google have hot traffic because the intent is high. People are searching out of necessity and urgency. A simpler way to think of it is to consider the obvious: if someone is typing your product/service (or better yet your brand name) into the search engine, it’s a safe bet to assume they’re interested in some form of conversion. Facebook, however, consists of traffic with no intent present to the user: aka cold traffic. Why? Because there is little-to-no intention behind the searches on social platforms — news feeds are populated for the users by algorithms instead of users searching directly for what they want. Luckily, the idiosyncrasies and interests that help guide these algorithms can also help you craft your audiences for maximum engagement. By choosing different interests and demographics of Facebook users, you can create a “Saved Audience.” Age, gender, car ownership, and being a follower of The New York Times page are a just few examples of possible demographics and interests. The combinations can be endless. However, it’s important to remember that these types of audiences have no prior knowledge of your business and may not need your product or service. So any saved audience you create will consist of cold traffic. Facebook calls retargeting audiences “custom audiences.” This audience is considered warm traffic because of these users’ previous engagement with your company. In having some minimal knowledge of your company, this type of audience is more likely to recognize and remember you. With this traffic, you will have the highest likelihood of turning users into leads/customers in terms of remarketing. Alright, this is where all the fun starts. Let’s put all that strategy and creativity into play. As mentioned above, creating one giant audience of all website visitors just won't cut it. Remember: those users are in all different stages of the marketing funnel. So it’s crucial that you create a variety of different custom audiences. Here are some strategies you can try today! I know I just said that this type of setup won’t cut it, but that doesn’t mean it has no place in the retargeting discussion. Creating a custom audience of all website visitors is better suited for a newer brand wanting to promote and increase awareness. A new brand has a small audience size to retarget, so grouping them all together should be ok. If your company’s website is seeing thousands of daily visitors, creating more granular audience segmentation is a good idea. We’ll get into that next. Make sure you restrict the audience's targeting with website visitors for the past 15-30 days. Anything over that time frame can include people that may have forgotten your website altogether. Different than “all website visitors,” these audiences consist of users that touched the different landing pages you might be running in your search engine marketing campaigns. If you own a company that sells superhero action figures, you might want to retarget someone who has visited a landing page dedicated to your products. Of course, you’ll have different landing pages for the different action figures you sell. You’ll want to serve the audience who has visited the Marvel landing page a marvel ad, NOT a DC ad, right? If your company is active with your blog promotion, targeting users that have found some value in your content can be a huge opportunity. However, if you have promoted your blog on your website, email newsletters, referrals etc., you might have too large of an audience size. It will end up costing you a pretty penny to pay for all those retargeting ads. Not to worry, there’s a solution. Simply create some custom combinations to coincide with the original blog reader audience. For those who are not familiar with custom combinations, this is a way to narrow down your audience further by including URL conditions. Adding more inclusions will hone in on an audience with higher intent. For example, you can create an audience that has visited your company’s blog article AND the pricing page of your website. Visitors of a pricing page usually have high interest in what you're selling. 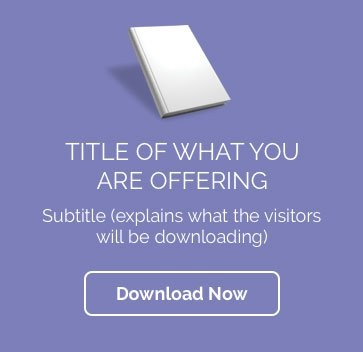 You’ll want to serve these visitors ads with soft CTAs. Asking to buy a product or sign up for the service you offer is too aggressive. Try offering a free trial or free consultation instead. If your eCommerce business is running Facebook Retargeting ads, cart abandoners is a retargeting must in terms of high-value audiences. 88% of online shoppers report having added a product to their cart without completing the purchase. Retargeting these potential customers will keep your product top of mind and drive them back to your site to complete the purchase. You could take this a step further and target people who have visited the personal/credit card information page of your checkout process. But be sure to provide less aggressive offers here too. Since something was holding the visitor back from inputting personal information, taking a step back and offering a softer CTA in an ad might persuade them to complete the purchase. This audience can consist of any person who has engaged with your company’s Facebook page. This includes people who have watched your videos, liked and shared posts, commented on photos, or any other possible interactions. A highly recommended idea would be to retarget people who have watched 75% of a video. This audience is more likely to be interested in your offer than someone who didn’t watch your video at all, or watched your video but stopped 10 seconds in. Some marketers might think that retargeting previous converters might be a waste of time. After all, they’ve already bought your product or service, how could they be a good lead now? Think about it this way, existing clients/repeat customers can bring returning revenue and help promote your business. They already like and trust your brand, so converting these customers again is a much easier feat than converting new visitors. Presenting this audience with additional discounts for business referrals can expand your clientele. For example, they could act as your brand ambassadors for a mere 15% off. Giving free samples of your new products to existing customers can boost sales for that new product. You never want to forget about your existing clientele. These people have committed to you already, so make them feel continuously valued and they will offer business in return. From setting up retargeting to testing audiences, your retargeting campaigns should now be able to start bringing in the big bucks. If you’re still unsure about where to start, try and remember one valuable lesson. That you’re remarketing to real people. Remarketing, unsurprisingly, can get pretty annoyingly aggressive without a well thought out strategy. Showing the same ads over and over will turn people off to your awesome business. Creating ads that resonate with particular audiences will be your best bet in a successful remarketing campaign. We're thrilled to have a guest post by Melissa Orellana, Content Manager at KlientBoost!